The Russian animation is really unique: it is very old and very young. It started in the Russian Empire, continued in both Soviet Union and modern Russia, and nowadays it is becoming a large industry. In 1991, after the collapse of the Soviet Union, the animated films production almost disappeared, and the further raising of the animated industry started in the very beginning of the XXIst century, while the government raised the industry financing, and some interesting short films were made. Since 2003, the Group of Companies “Riki” started the production of “Kikoriki” series. This project became the impetus to the development of the industry. The “Kikoriki” gained Russian TV-channels soon, and during 14 years more than 200 episodes were made. The project was broadcast on Russian television more than 70,000 times and broadcast in 90 countries. The company also has three features about adventures of Kikoriki crew (the latest one will be released in April 2018) and two spin offs of the TV series : BabyRiki and Pin Code. In 2003 another big project started to develop – Melnitsa Animation Studio realised the first feature film “Alesha Popovich and Tugarin Zmey” . The famous Russian animated film director Konstantin Bronzit (Oskar nominee for shot films “Lavatory Story” and “We can’t live without Cosmos”) become the director of this film. Later, 7 features about Russian legendary bogatyrs were made; the franchise has collected the biggest box office in the history of domestic animation. In 2008, the new series “Masha and the Bear” came out to become a new symbol of the country. The series about a naughty girl and a large good-natured Bear became an international project. Nowadays Masha and the Bear is among top-5 the most popular brands in Europe after Disney and Lego. Another breakthrough in the field of Russian animation occurred in 2010, when «KinoAtis» company released in the USA the first Russian feature animated film in 3D «Belka and Strelka. Space Dogs». Nowadays the company has 4 completed feature films and one film in production. It is also has two serials in production «Planet Ai» and «Space dogs. Reboot». “The Fixies.Top secret” which was released in late 2017 in Russia. International release of the film is scheduled for early 2018. Another Russian studio which become well-known for it’s features is Wizart Animation. The companies most successful project is “Snow Queen” – three animated feature films become the most famous Russian animation franchise abroad .The film was shown in more than 130 countries and it’s world box office is more than 50 million dollars. The oldest Russian and the only state studio in Russia «Soyuzmultfilm» studio, which produced dozens of cartoons and used to be considered a classic of Soviet animation, and actually stopped releasing movies in the nineties, nowadays got a new life. The studio launched the production of several TV series in the nearest future. Also «Soyuzmultfilm» is becoming the center for the creation of Russian animation technopark, which collects technological innovations and creates conditions for animation startups. Today Russian animation industry is of interest to international partners. We already have some results of international cooperation. TV-Series «Yoko» which was made by Russian studio Wizart and Spanish companies Somuga and Dibulitoon are translated on TV in Russia, Spain, India and Sri Lanka. KinoAtis company become the first company in Russia which created a feature in coproduction with European countries: Czech «Rolling Pictures, spol. s r.o.» and the Belgian «Grid Animation». In 2017 the production of the first joint Russian-Chinese project «Panda and Krash» began – coproduction of CCTV and RIKI-group. The Russian industry has already proven it’s reliability as a partner in coproduction and our companies are interested in further international cooperation. Nowadays there are more than 50 animation studios in Russia which produce more than 4 000 minutes of animation in a year. The last catalog of Russian Animated Film Association includes about 170 projects: TV series, features and short animated films. Being small some decades ago, the Russian animation is turning into a large industry. 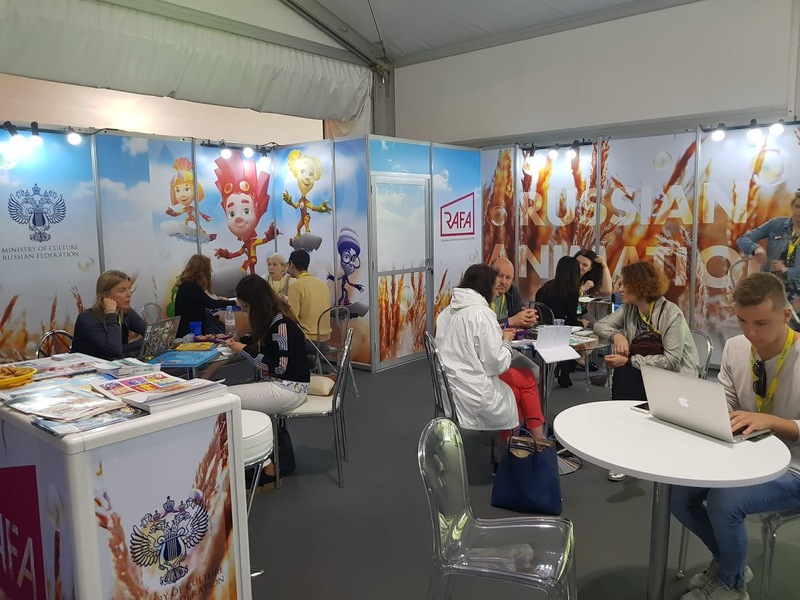 Russian animated films got dozens of awards at international festivals, billions of viewers on YouTube, hundreds of broadcasts on TV-channels in different countries, and millions of spectators in different continents.